In addition to offering high-quality instruments for sale and rent, we also perform repairs and restorations of all varieties. If your instrument needs a repair of any kind, or if you would simply like to have your instrument checked over, please bring it to the shop any time during the working hours. 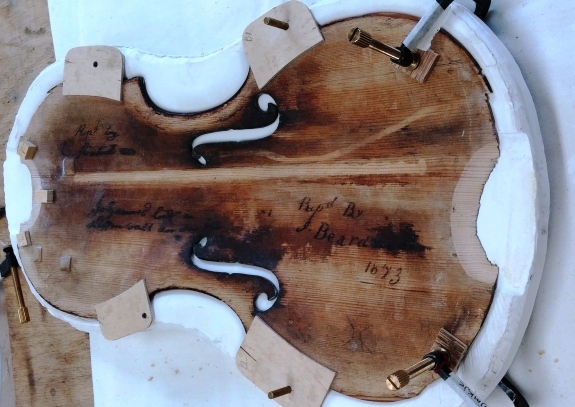 Our luthiers will examine the instrument and recommend appropriate repairs based on technical knowledge and more than half a century of combined experience. We will talk through the list of repairs with you to explain the details of the process and answer any questions you might have. If you prefer, we can provide an itemized, written estimate for $15. If you go ahead with any of the work, this fee will be waived. We make our estimates based on what will be best for playability and sound quality, but if your goal is to simply have an old instrument cleaned and strung up for display, we are happy to do this as well! After you approve any of the proposed repairs, we will let you know how long it will take and provide you with a loaner if necessary. The following is a list of a few common repairs. These are only the most common repairs - we will restore ANY instrument to perfect playability! The bow specialists in our shop are in high demand. Every day we receive shipments of bows for repair from shops all over the country. As with instrument repairs, we will provide a detailed explanation of any bow repair we recommend, and provide a loaner if needed. The following is a list of some of the most common bow repairs. Again, we can restore ANY bow to perfect playability.